The United States Congress designated the Beaver Creek Wilderness (map) in 1975 and it now has a total of 4,816 acres. All of this wilderness is located in Kentucky and is managed by the Forest Service. The Beaver Creek Wilderness is a secluded hardwood forest in southern Kentucky, and is located within the boundaries of the Beaver Creek Wildlife Management Area. 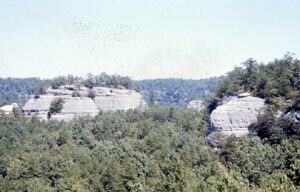 The wilderness is almost totally enclosed by towering sandstone cliffs. Below these high walls you can find natural arches formed by the elements, and rock shelters used by Native Americans and early settlers. Much of the year the forest is alive with flowering trees, shrubs, and low-lying plants. Many species of wildlife make their home here, including wild turkeys, white-tailed deer, ruffed grouse, red and gray foxes, rabbits, muskrats, mink and raccoons. Eastern black bear populations also flourish within the wilderness and surrounding forest. The eastern mixed mesophytic forest is a dynamic ecosystem. The forest continually changes through time as a result of disturbance events such as wildfire, tornados, ice storms and insect infestations. These events create opportunities for new growth and changes species diversity within the forest. The remnant impacts of storm events within the Beaver Creek Wilderness provide an excellent opportunity to experience the dynamics of forest succession. Beaver Creek Wilderness is part of the Beaver Creek Wildlife Management Area. Fishing, hunting, hiking and primitive camping are among the recreation activities you may enjoy in this wild area. Hikers should be prepared to encounter numerous trees that have fallen on designated trails. Planning to Visit the Beaver Creek Wilderness? How to follow the seven standard Leave No Trace principles differs in different parts of the country (desert vs. Rocky Mountains). Click on any of the principles listed below to learn more about how they apply in the Beaver Creek Wilderness.